Designed for all-mountain riding, specced for performance and moulded for comfort, the Giro Chamber II MTB shoes have created quite the stir, often selling out as soon as they hit the shelves. Constructed from a breathable and water-resistant outer material, the Chamber II shoes uses a moulded DH EVA footbed with arch support and an outsole developed from a Tri-molded SPD-compatible shank with 10mm setback, full Vibram Megagrip outsole with Optimized EVA midsole to enhance the contact points. With lace and strap enclosure, these shoes are also fitted with additional reinforcement around the heel and toe areas to provide additional protection from impacts. 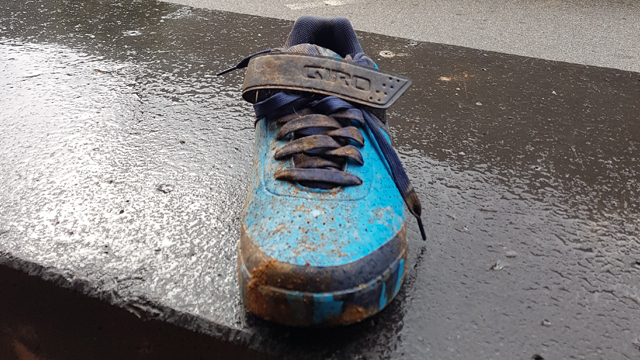 Ben’s been out wearing these shoes come rain or shine on the trails, even travelling to Finale to put them through their paces. So, how did he get on? The first time I tried this shoe was in Finale a few months back, and it’s always a gamble to go away with new kit just in case they don’t fit. But I was amazed by how good these are, and they have now become my go-to pair of shoes. I’ve tried loads of cycling shoes since I have owned my shop and these are by far the comfiest shoe I have had with a great balance of flex and stiffness. My last pairs of shoes were the Shimano AM-9 which I found to be nice and light with good feedback through the shoe, but I found I had to run a big platform as my foot would bend around the pedal where it flexed too much for my liking. I also had last years Giro Chamber shoes which I found too stiff and lacked in feedback. It seems like this is the Goldilocks of shoes for me. For more information on the Giro Chamber II MTB Shoes, head over to Giro’s website. And if you fancy yourself a pair, we have them available in the Afan Valley Bike Shed for £110.